Chasing Impossible focuses on Abby and Logan’s story. From the moment Katie McGarry introduced them in her previous books, I’ve been curious about their story. Logan is a daredevil. He’ll go to extreme measures to get an adrenaline rush. What makes a person go to those levels? We find out that Logan was diagnosed with Type 1 diabetes when he was seven and that he crashed on the operating room table when he was eleven. Ever since then, he’s been cheating death, trying to feel alive. Abby’s a drug dealer. What makes a seventeen-year-old girl choose to go down that path? We learn that Abby’s father was a drug dealer and has been given a life sentenced for committing murder. Abby’s grandmother, the person she loves the most, has Alzheimer’s and has to be taken care of by three nurses, which is very expensive. This is what causes Abby to follow in her father’s footsteps. One thing I love about Katie McGarry’s writing is that she never takes the easy way out. Her characters always have real consequences for the choices they make. The happily ever after doesn’t just come to them; they have to work hard for it. This is very true for Abby. At the end, without spoiling anything, Abby has a hard decision to make. Neither of the options is desirable, but she still has to own up for her actions. Logan and Abby’s romance is a good one, but that is just a part of the book. The story focuses on discovering who each of them are as a person. It’s about living with the choices you make and the consequences that come with them. It’s about moving on from the past to try to have a better future. It’s about deicing who you want to be and how you’ll work to get there. Overall, I really loved Chasing Impossible. 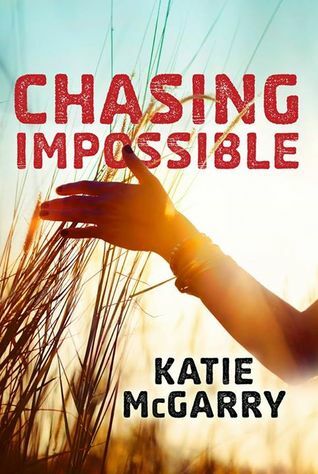 This is a must read for fans of Katie McGarry’s Pushing the Limits series. The little cameos from all the other characters make it an especially fun read. Even if you haven’t read the other books, you’ll still enjoy Abby and Logan’s story.